How much does it cost to travel to Zadar? How much money will you need in Zadar? kn445 ($67) is the average daily price for traveling in Zadar. The average price of food for one day is kn130 ($20). The average price of a hotel for a couple is kn576 ($87). Additional pricing is in the table below. These average travel prices have been collected from other travelers to help you plan your own travel budget. You'll find Zadar in northern Dalmatia, Croatia. It is located on the Adriatic Sea and is the center of Zadar County. 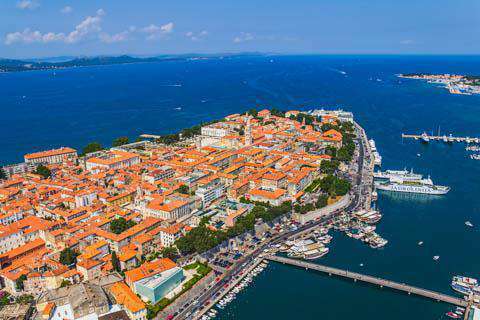 It is both the historic center for the region and the seat of the Roman Catholic Archdiocese of Zadar. There are a handful of sights around town, most of which can be explored on foot. The climate for the city is a mix between humid subtropical and a Mediterranean climate. The winters are usually mild and wet, and the summers are humid and warm. The hottest months are July and August when temperatures can exceed 30 degrees Celsius. Average yearly rainfall usually exceeds 917 mm. Fall months often remain warm and temperatures are often around 30 degrees Celsius as well. In general, the temperatures rarely drop below freezing, even during the coldest month of January. The rainiest months are October and November, although winter is considered the wet season. July is usually the driest month. Water temperatures are around 25 degrees Celsius in July and August and it may be possible to swim any time between May and October. You'll find you spend most of your time in the city's quaint old town area, which has the highest concentration of historic sights, and the most attractions that appeal to visitors. You'll find thirty four different churches in the old town alone, with the oldest being Saint Simeon. The best preserved church in the area is Saint Donat's, which has also evolved into the symbol of the city, making it quite recognizable. The church now acts as a museum and no longer holds religious services. It does often have music concerts in the summer months however, which can be fun to attend. Also make sure you take a walk through the Roman Forum, which is one of the most preserved Roman Forums in the world. It's also a great place to people watch, as many locals come here to relax on a nice day. Saint Anastasia is another nice cathedral in the city, and Saint Mary and Saint Simeon are other churches that now act as museums worth visiting. The University of Zadar is a fun place to wander. It was founded in 1396, making it the oldest university in Croatia. Most of Zadar's sights are concentrated in the Old Town area. The area was originally built by the Romans and today there is a high wall that remains on the harbour side. It was originally built by the Venetians in the 16th century and it's entrance gate still has the Venetian lion. A short walk from the Old Town is Arbanasi. This is a charming, village-like neighborhood that has hotels, hostels, restaurants, and other amenities for visitors. As you move farther away from the city's Old Town, you reach the economic center of the city. There is a suburban atmosphere with industrial parks and commericial districts that sprawl out. About six kilometers from the city center are the beach suburbs of Diklo and Boric. There are a good number of hotels and hostels in this area as well. If you've seen your fill of old churches and historic sights you can head to a beach for the day. Some of the top beaches in the area for swimming and sunbathing include Kolovare, which is the closest to the city center, Borik, a large hotel complex, and Vitrenjak, which is popular with local families. There are a descent number of good restaurants around town, many of which offer some good Croatian food or seafood options at a reasonable price. You can find some genuinely authentic cafes that you may not see at more touristy destinations such as Dubrovnik or Split. There are a few hotels and hostels around town that are reasonably priced and offer good sleeping options. Generally, reservations are not required as they do not usually fill up. Most tourists spend a significant amount of time in the Old Town, which is very walkable. If you're planning to travel further way then there are local buses that run frequently. You can catch either the 2 or 4 lines in the Old Town area. Most of the buses are relatively new and reliable. The main bus hub is Mala Posta, and from there you can catch a bus to almost anywhere. Taxis are common but are prone to overcharging tourists, so make sure that you know in advance how much your trip should cost. Confirm the price before you even get into the vehicle to save yourself the hassle at the end. Most taxis can be caught on either side of the bridge in the Old Town as well as near the bus and train stations.